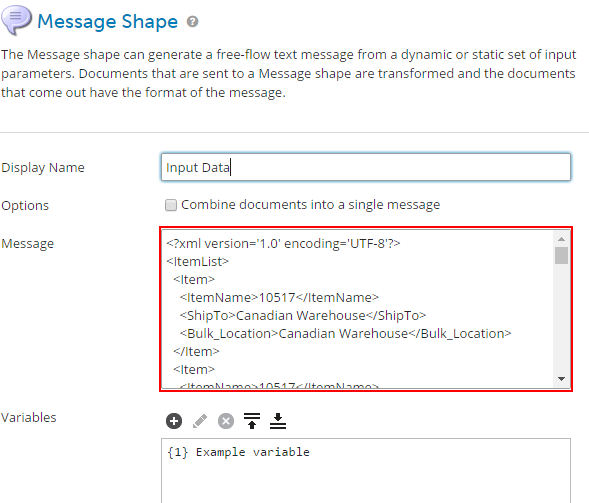 In Dell Boomi, the most use shapes for testing will be the Message shape and Exception shape. Although the message shape is useful to any test case, the Exception shape will be mostly utilized in negative test cases. The Message shape can take the place of a connector retrieving input to ensure the input data is consistent between tests. As an example of the Message shape, we will make a test harness for the sub-process NSToDS.Inventory in the integration below. For the harness, the only relevant shapes are the Set Properties shape and the process call itself. Those can be copied into a separate process with a No Data start shape and a Message shape. The Message shape (labeled Input Data) will contain the test data. The data can be handwritten or taken from a test run of the original process. Ensure that it is in the correct structure. In this case, the structure should adhere to the destination profile of the map. If extensions are used in the original process, enable the relevant extensions in the test harness and remember to set them in the Test Extensions window. Now the test harness should be ready to test. While testing the negative test cases, it can be at times difficult or tedious to consistently test the same error message. This is where the Exception shape shines. The Exception shape can be used to generate a consistent and predictable try/catch message. The important shape to note in the example below are the Exception and Try/Catch shapes. Each of those Exception shapes is simulating an error that would normally occur in a much larger process, thus allowing quick testing of changes to the catch branch in multiple processes and error cases. The Dell Boomi AtomSphere integration platform is a shared-everything, multi-tenant platform that supports cloud-to-cloud, SaaS-to-SaaS, cloud-to-on-premises, on-premises-to-on-premises and B2B integration. Boomi AtomSphere supports real-time integration and elastically scales to meet high-volume needs in mobile, batch (ETL) and EDI Software environments. Easily accessed via a browser, it delivers an impressive range of integration, master data management (MDM) and platform extension capabilities. Tallan is a certified Dell Boomi Partner specializing in iPaaS platform integrations. We specialize in Integrations using EDI Software and Dell Boomi as the iPaaS platform of choice. Leverage Tallan’s vast integration experience for your AtomSphere platform needs. Our certified architects and developers provide the expertise, best practices, and guidance to deliver a successful integration solution. We hope this guide will help you in your use of AtomSphere. If you have any questions or comments, or need assistance with any Integrations or development questions, please contact us at integrations@tallan.com. To learn more about Tallan’s integration experience with Dell Boomi, CLICK HERE to check out our solutions today!